I have had another off week, I feel like I am running so far behind. I really wish I had some of the macarons that I am going to write about today. I was close to the shop yesterday and just completely forgot to pick some up. Beautiful macarons from Chantel Guillon- they might be the best macarons that I have ever had. They have the perfect texture, chewy, but with a crunch. I am a macaron fanatic, for so many reasons. They take wonderful photographs, they taste so yummy, and have this chew that is to die for. I just, I’m drooling right now thinking about them. Damn, I really should have picked some up. The middle one is the Mother's Day rose macaron, it was my favorite of the day, so good. Yesterday Braedon and I were all over San Francisco, we went to a park, a cafe, walked around, went to Gareth’s office, and then finally made it back home. I am wiped out and pretty much didn’t get any blog stuff done. But that’s okay, I’m still working on my schedule and my son is my number one priority. This weekend, I’m going to brunch with the ‘trifecta,’ as Gareth calls them. I’m excited! Plus, it’s somewhere that I really, really, have wanted to go for a while. Marlowe’s. Let me describe my face right now, my eyes are huge, and I’m drooling about deviled eggs. Maybe I’m just hungry. On to the reason of my post, macarons! If you’re ever in Hayes Valley in San Francisco, go to Chantal Guillon. These are by far the best macarons in the city. Gareth and I walked in on Mother’s Day and I told the cashier, I want one of each. I think they were surprised. I love the little shop, it’s very sterile, small, perfect to sit and drink a cup of tea or coffee. We didn’t stay long, Braedon was in the middle of a nap, maybe next time I’ll stay much longer. It’s pretty good for families, they have outdoor seating, for when it’s hotter in the city like it has been lately. The nice man behind the counter hands me two boxes, one of 12 macarons and one of 6 macarons, I open them and look at all of the beautiful colors. I tell Gareth we cannot eat them until we get home. I don’t think that he liked that very much. 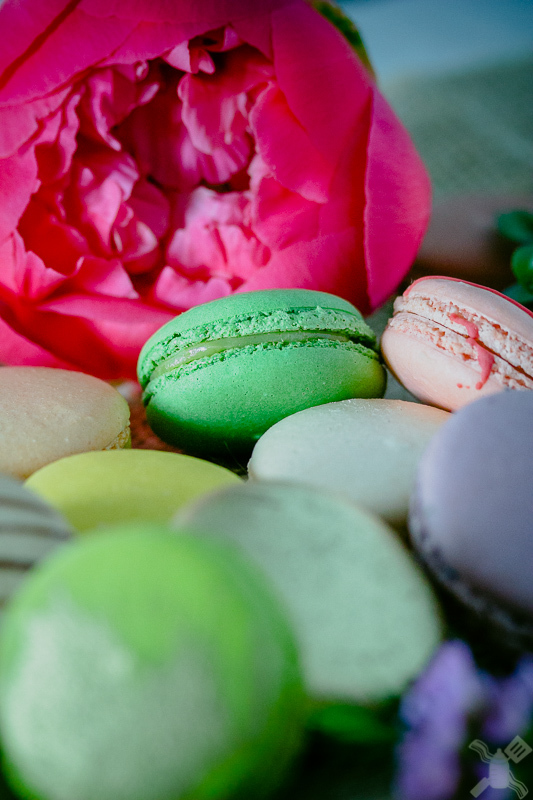 Beautiful macarons with beautiful flowers, it is perfect. They gave us a little tasting guide, it was really useful. There are some that I didn’t want to taste and some that Gareth didn’t want, so we could pick which ones that we liked! The mango was a gorgeous green and orange. Gareth loved it, he loves mango. I thought there was a little of a strange taste to it. I don’t know, it tasted like hairspray to me. The Mother’s Day raspberry and rose was absolutely amazing. I think that it was my favorite. It had a rose gold flower painted on it. So pretty, almost too pretty to eat. This had the most intense flavors of all of the macarons that I ate. Gorgeous Mother's Day macaron- so my favorite. Raspberry and rose go so well together that I want to try them in other recipes very soon. The apple, passion fruit, lemon, and red velvet were all really good, the flavors were subtle, but great. The orange blossom strawberry was very good, the orange was dominant over the strawberry. I would have loved some more strawberry, but it is definitely one that I would recommend. Pistachio and salted caramel were both something that were super appealing to me, but not to Gareth. I loved the salted caramel, the gold flakes on it were so pretty. 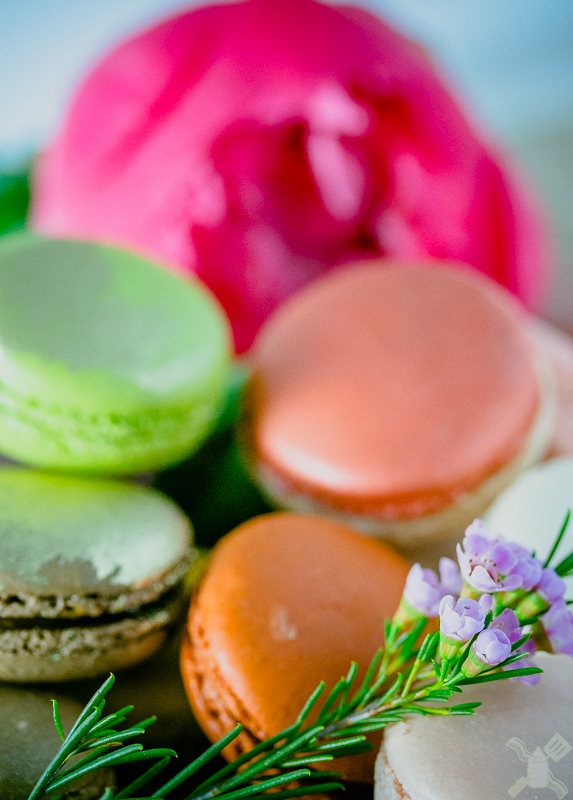 Salted caramel, vanilla, orange strawberry, and apple macarons, each tasty in their own way. Lavender blackcurrant was my second favorite one. The lavender perfectly complimented the tartness of the blackcurrent. Coconut, almond, and earl grey were all good, texturally perfect, but needed a little more flavor. Hazelnut, tasted like Nutella, vanilla like ice cream, rose like one smells (loved it). Finally, green tea, I love all things matcha, but I would have loved it more with more flavor. Overall, go get macarons, go get them right now. You need to go to Chantal Guillon right now. While you’re on my blog, you should check out my collaboration with Miss Cheesemonger and make some awesome bacon mac and cheese. Join me on Instagram, things have been going great there! Twitter, you should talk to me, because I love conversations! :P Snapchat: Whatzername- because you can see my cute baby! Pinterest, because why not! What does the rest of your week look like? See you Friday, after dark!